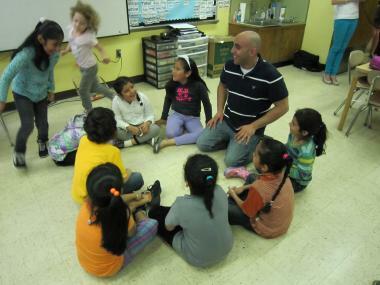 Mohamed Mamdouh, a teacher for the Global Language Project, played a game of "Duck Duck Goose" with kids at P.S. 368 in Harlem to help teach them Arabic. HARLEM — It looked like any other group of second graders playing during recess at P.S. 368 in Hamilton Heights — except that the students were being given instruction in Arabic. Students responded eagerly as teacher Mohamed Mamdouh led them in "duck, duck, goose," musical chairs and other games while drilling them on vocabulary words like "baba," or father, and "madrasa," or school. "You get to learn new words. It's a little hard, sometimes you forget," said Jayren Foster, 8, " I like talking in Arabic and we get to play." Jayren is one of the more than 200 students in the second through fifth grades at P.S. 368 taking part in the Global Language Project's pilot Arabic education classes. Any parent who adamantly opposes the classes will be given alternatives, organizers said. "This is important because in the near future, Arabic is going to be a global language," Mamdouh added. "These kids are like sponges the way they learn the pronunciation and the words." Organizers hope to distance themselves from a controversial 2007 attempt by the Khalil Gibran International Academy in Fort Greene, Brooklyn to open a school with a dual English and Arabic curriculum. The program was engulfed in controversy after critics accused it of being part of an agenda of promoting "radical Islam." The founding principal resigned before the school opened its doors, after critics accused her of being connected to a set of T-shirts that read "Intifada NYC." The city announced that the school would close last year due to poor performance. Maggie Mitchell Salem, executive director of the Qatar Foundation International, said there is nothing controversial about the Harlem school's effort. "I think it's controversial to not bring Arabic to a city that embraces the world. How do you leave one language out?" asked Mitchell Salem. "Everywhere we go, we make sure the community wants it. We don't want people to be turned off by the Qatar in our name or think we have an agenda." P.S. 368 principal Nicky Kram Rosen also embraced the program. "I feel like the luckiest principal in the world," Kram Rosen said. "We are teaching them an important language for the future but exposing them to languages spoken in their own community." Of the 239 students at the school, 22 percent are English-language learners. More than 77 percent of the kids receive free lunch. The school just welcomed three families from Yemen who speak Arabic. The U.S. State Department added Arabic to its list of critical languages in 2001. Studies show that learning a foreign language can help students' cognitive development, test performance, creativity and higher order thinking skills. "This is now a global economy. They must be able to transition across borders and across cultures," said Angela Jackson, founder and executive director of the Global Language Project. "We want them to have as many options as possible on where they will live, study and work." Students and parents at P.S. 368 are enthusiastic supporters of the program. Francina Perez, 8, a second-grader at the school, said some Arabic words remind her of Spanish, which she already speaks along with English. "I might try to speak Arabic if someone says something to me," Francina said. Bella Moon Castro, a parent-volunteer at the school said her third-grade son Gabriel is looking forward to taking Arabic in the fall. She says she has noticed that he has developed increased confidence and has a greater level of comfort in a group setting. Even his already-high reading skills have increased as he is better able to connect words. "For us here, we are such a big, diverse community. There is no opposition to this. We see this as a chance to go above and beyond for our kids to make sure their education is inclusive," Moon Castro said. Organizers added that the key with language learning is to start early and make it enjoyable for the kids. Many language programs don't begin until high school, and involve rote memorization rather than interactive learning, they said. And while many adults think learning Arabic is difficult, that's not necessarily the case for kids. "A lot of people ask 'Is Arabic hard?'" Jackson said. "It can be hard for adults, but no one has told kids that Arabic is hard. That's the beauty of starting young. There are no preconceived notions." Mamdouh referred to his students as "blank slates," excited to be taught something new. "They could be at recess — but they'd rather be here," he said.